If you are a fan of Ice Cube’s Friday series, then you are familiar with one of this actor’s legendary roles, as “Pinky” the local Pimp with pumped-up hype in Next Friday and Friday After Next. Clifton Powell has also made appearances in Menace II Society, Dead Presidents, Ray, Just Another Day, Why Do Fools Fall in Love, Rush Hour, Deep Rising, Phantoms, and as Dr. Martin Luther King, Jr. in Selma Lord Selma. These are just a few of the long list of television shows, films, and box office features in which this notable and eminent actor has had the pleasure of exercising his craft. T2T had a chance to get to the bottom of what has made this actor so gifted and what’s more…how he tackled his latest project as Rex Fisher in Saints and Sinners. T2T: How does it feel doing this first original drama series on Bounce TV? CLIFTON POWELL: First, I want to say I am grateful to be in this series. It’s all God’s work. For me, it’s historical! You see, I‘ve been in the game a long time and I have never played this type of character on a major network. The power and strength this character, Rex Fisher portrays is daunting, tough, and dangerous. The last person to play this type of character was Avery Brooks in A Man Called Hawk. Today you have Scandal, Power, and Empire…well Hawk laid the foundation for that. I love that Rex is multi-dimensional and not watered down. T2T: Your filmography is impressive with various characters you have portrayed. Some comical, some deadly, some spiritual, and even those we love to hate. I know that can be attributed to you taking your craft seriously, which makes you dedicated to the authenticity of each character. What elements did you have to bring into the role of Rex Fisher that were different from any other role? CLIFTON POWELL: When you study the technique of Gene Hackman, Angela Bassett, Charles Dutton, Taraji P. Henson, in what we call “method-acting” ( a range of techniques for training actors to achieve better characterizations of the character as formulated by Lee Strasberg. These techniques can be traced to Constantin Stanislavski’s ideas). Marlon Brando (known for The God Father) is another actor that has mastered this technique. The bottom line is finding the truth, using substitutions, and researching to build upon the character. When you add the creative emotional aspects, you can hit it the right way every time. Listen, method acting goes from the inside out, building from a psychological standpoint and then adding the physical traits with costuming and makeup…in no time, you will be ready to live in the moment and the character’s truth. I will soon be teaching fundamental and master classes on these techniques. T2T: The cast list is impressive. You got to work with a plethora of talented people. What was the highlight of filming this drama? CLIFTON POWELL: In the past, the most episodes in a series that I had to do were five; this one was a total of eight. The challenge was staying connected to the emotional strength of the character - to be consistent every day. I have played tough guys before, so, people expect to see grand slams every time. I like to study at home to hone in on my objectives and beat. Then when I get on set, I am very prepared. I especially wanted to with this series. T2T: I can imagine, as with any project you take on, you do so with some expectations as to where you want to see it go. Were there any expectations with this drama, if so, what are they? 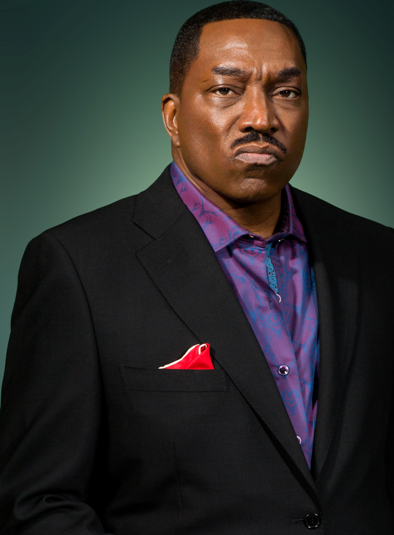 CLIFTON POWELL: Honestly, I believe that Bounce TV is making TV history. I would love to see all of our fans, Vanessa Bell Calloway’s fans, Christian Keyes’ fans, and Bounce TV’s fans to get behind and support this series so it can run for 5 years or more. If you don’t have the network in your area, then go to the website and follow the instructions to watch it online—for FREE! T2T: Well, Trendsetters to Trendsetters will be doing our part to get the word out. What can the audience expect when they watch Saints and Sinners? CLIFTON POWELL: (does his signature baritone laugh) Get your popcorn out, get your work done early, and get ready to be entertained on every level. You are going to laugh, cry, and try to figure out what’s going on. It’s going to be riveting, exciting, and it’s not going to go where you think it’s going to go…the “fun” part was trying to figure out where the writers were going to go with this series. So you will share in that experience; it’s going to be juicy and be still, don’t move off that couch, or from in front of your TV…or else you might miss something. Block out your time and just really enjoy it! T2T: Clifton, I can’t imagine you being idle for long, so what is next on the horizon for you? Do you have any other new projects? CLIFTON POWELL: I just finished a film with Director John Singleton called Snow Fall. It’s hot, and I also finished playing Floyd in the 2Biopic: “All Eyez on Me.” I will be doing another project, a play that will tour called Married But Single by Je’caryous Johnson. We will be in DC, SC, NY, and LA so far. The cast includes Lisa Raye, Darren Henson, and Carl Payne, to name a few. T2T: Thank you so much Clifton for your time…I have just one last question, probably the most important one. How can your fans keep up with you and your projects? I really truly hope everyone, African American, White, Latino, Asian, and ALL, tune in and support. WE want all of our fans to share in this historic entertainment moment for Bounce TV in creating a drama for mainstream media. Look out also for me in Choir Director and The Preacher’s Son coming out soon. One more thing, I will produce and direct my first project called A Special Kinda Love with Powell Pictures and Entertainment…check out my social media sites to know when everything I have shared will be out. Thanks for the love! T2T: You are welcome and we thank you for gracing us yet again with your amazingly gifted talents and we will be tuned in on Sunday nights.